The Singapore Land Authority (SLA)’s OneMap IdeaWorks! Campaign culminated in an exhibition and award ceremony on October 12. The winning teams received their awards from the Minister for Home Affairs and Minister for Law, Mr. K Shanmugam. In addition to exhibition booths demonstrating the solutions by participating teams, apps and services by adopters of the new OneMap were also showcased to the public at this Ceremony. OneMap IdeaWorks!, along with the new OneMap, was launched by the SLA in July this year. The new OneMap is the authoritative national map of Singapore with the most detailed and updated map information. It represents multi-agency collaboration with many government agencies currently participating and contributing useful day-to-day information and services. A set of Application Programming Interface (API), such as base maps, address search, routing and reverse geocoding, is also available at https://docs.onemap.sg for developers to leverage on to create map-based applications and services. The objective of OneMap IdeaWorks! 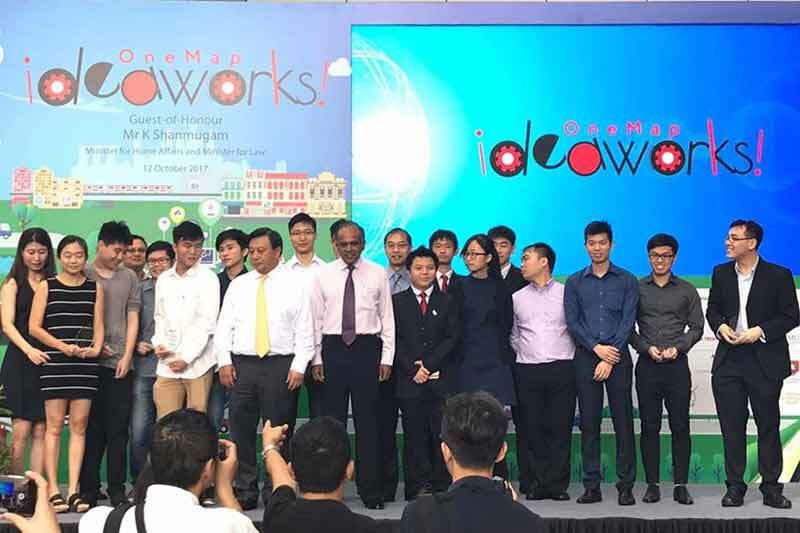 was to foster co-development of geospatial solutions to overcome daily challenges faced by communities through the use of the new OneMap and open geospatial data, in support of Singapore’s Smart Nation initiative. Challenge statements, received from over 30 community and public agency partners, were grouped into the following categories: community, social services, environment, health, transport and heritage. Technologists and data scientists responded – students and professionals from universities, polytechnics, Institutes of Technical Education (ITE), start-ups and the industry. Solutions could be developed in the form of mobile, web or analytics applications. The evaluation criteria included impact (40%), originality (30%) and sustainability (30%). A total of 22 teams participated in the Challenge, comprising 12 teams from the School Category, for students up to undergraduate level, and 10 teams from the Open Category, for the public, technologists and data scientists of all ages. Following three months of ideation, prototyping and technical sessions, four teams made it to the finals after the preliminary round of judging. Team Sole Survivor from the Singapore Institute of Technology (SIT) won in the School Category with an application called WhereMyJob, which allows users to search for available jobs by location or by type of job. The challenge statement it addressed was ‘How can we help job seekers to use map approach to query and filter job openings from Jobsbank?’, which was set by the Singapore Management University (SMU). The runners-up, team bro code from the National University of Singapore (NUS) sought to address the challenge of creating a map-based app that suggest various cycling/ hiking routes through park connector networks, parks and nature reserves based on a pre-selected challenge level. This problem statement was from the Ministry of Social and Family Development (MSF). The mobile application called OneRoute developed by the team suggests cycling routes for the users, utilising Singapore&apos;s extensive network of parks, nature reserves and cycling paths. Users can customise the workout or journey based on the desired distance, difficulty and locations. In the Open Category, team LDR Technology won with a mobile application named ‘My Smart Kampong – A Punggol Community Experience’. It allows residents to search and locate services and provides opportunities for residents to organise activities and collaborate in various interest groups. The GRC (Group Representation Constituency is a type of electoral division or constituency in Singapore in which teams of candidates, instead of individual candidates, compete to be elected into Parliament) can use the application as an engagement tool to disseminate latest events as well as for volunteer management. The challenge from Pasir Ris – Punggol GRC Grassroots was: How can we help young parents to embrace parenthood and help the residents locate eating places in Punggol? Spacetime Care App was the runner-up in the Open Category. It is a solution to support the elderly and the less privileged in society with better care through movement tracking, fall and other alerts in time of emergencies. This was developed in response to a challenge statement from SG Enable to develop an app or system that will allow caregivers to track the location of their loved ones, with the ability to set geo-fences and contact their loved ones in case of emergency, and vice versa. The winning teams in both categories received S$3,000, along with S$5,000 worth of AWS (Amazon Web Services) credits.